THE GREEK WARRIORS WANT YOU! Membership in The Greek Warriors is separated into two categories. Active and Auxiliary members. You can request membership in The Greek Warriors by way of a simple email to George. All members whether active or auxiliary will receive our periodic News Letter to keep them advised of our schedule and updates about the group. Active members are those who can actually participate with us in an event. Greek armor is supplied from our inventory for those who wish to participate but do not own their own armor. We also supply Tunics and Sandals, but would like repeat members to at least purchase these items for themselves. We will provide guidance for armor, tunic, and sandals purchases for members who wish to invest in their own kits. Since we do have a large inventory of Greek armor, we can continue to provide armor for repeat members if they cannot buy their own armor. Auxiliary members are those separated by distance who cannot actually attend one of our gatherings. Auxiliary members will receive the same periodic News Letters that active members get to keep them advised of our schedule. 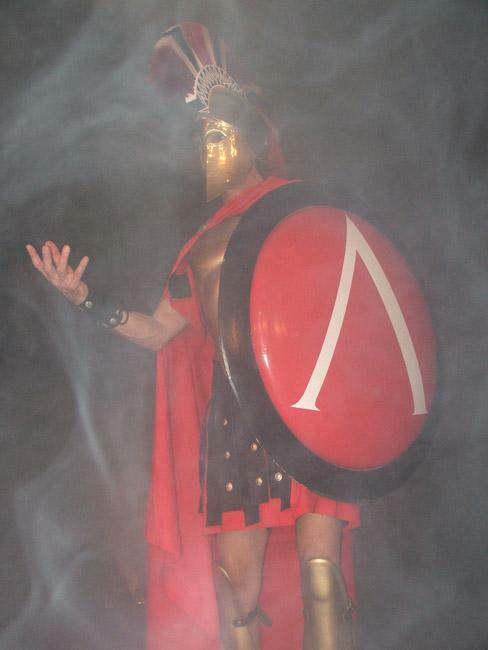 Auxiliary members will also receive the same guidance in Greek armor purchases. The Greek Warriors list of members in the Greater New York area. Our Member Bill from Texas, has composed a number of classic Greek Hoplite poses like those you would see on Greek Pottery. Bill is an artist and has made most of his own armor, including the beautiful Linothorax that you see him wearing in these pictures. We are proud to have Bill and a member and a friend. View some of the arms and armor that The Greek Warriors use! When the Spartans at Thermopylae were told to give up their weapons, King Leonidas said: Molan Labe, meaning Come and Take Them!